So says one real estate agent. Is this indicative of the market returning to Highlands and Cashiers area? It has often been said, “The first person to make a mountain out of a mole hill was a real estate agent.” This can also be true when you ask an agent how the market is doing. An agent can be very busy due to their marketing skills, bringing in buyers and closing deals. However, this is more of an indication of that individuals marketing skills rather than an overall market indicator. To understand the market you need real market data, not opinions. For example, this broker has several sales under contract with more in the pipeline. If you ask me how things are going I would tell you, “Fantastic! It’s the busiest I’ve seen in years!” Such enthusiasm could lead a seller to think the market is really doing very well. In reality the market is holding about the same. What’s the difference? Perception. To fully understand how to sell your home, one needs to recognize the difference between a salesman (one that may get you to believe what he is telling you so that you will acquire his service) and a marketing agent/broker (one that shows you the facts and how to get your home sold). Is there a difference? See Salesman or Agent, is There a Difference? While we do see a larger number of homes sales in the summer months, this is typical. 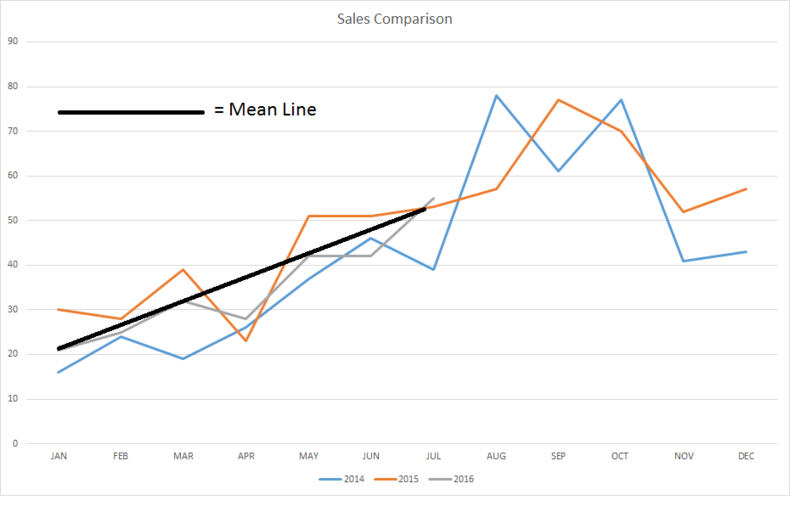 In looking at the graph below, which includes a Mean Line, we see that overall sales have been a little low with July seeing some rise. In general, sales look to be on target with the past few years. Excitement builds whenever we see anything positive, which is the way it should be. Still, we need to look at a much larger picture to understand the facts and what is really happening. 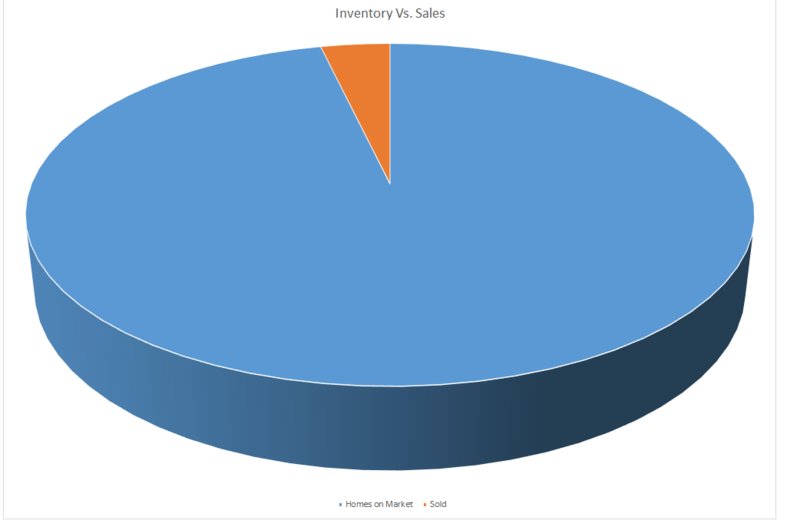 One of those facts is understanding Inventory. That little orange slice is the 55 homes that sold out of the inventory. Just imagine that yours is one of the 55. That’s a very small slice for which you need to be very competitive to sell. Keep in mind that there were 107 new homes listed in the same time period, which more than fill that hole of 55. This agent had a client that had their home listed with another firm for $500,000. The clients were upset that their agent didn’t sell their home. When a Comparative Market Analysis was done, the suggested price of the home came in nearer to $400,000. The homeowners insisted there was no way. This agent lost the listing to another agent willing to list it much higher. It’s been 3 years and the home is currently listed under $400,000, for which it should sell. Agents don’t drive the market. Buyers do. Total homes listed in Highlands/Cashiers MLS: 1450. Homes Sold This Month: 55. Average List/Sell Ratio: 93.72% – This is based upon the “List” price at the time an offer was made. Many homes had higher prices initially, then reduced after long periods of DOM. Synopsis: Quick sales should not be expected. One must price very well to expect a sale. Reasonably priced homes are shown, so if you’re not being seen, you may want to consider your pricing. Land Units Sold: 15 – This is below the previous 2 years for July. Synopsis: Land sales are holding pretty steady, which has been very low. 16% of home sales ranged from $500,000 – $749,999. Sellers, we are coming to the end of the busy selling season for our market area. If you want to sell this season and have had little to no views, talk with your broker immediately. You may want to consider a price change. Buyers, don’t be afraid to make an offer. Although the selling season does taper off, so do many of the listings as some will remove their listing for winter months.